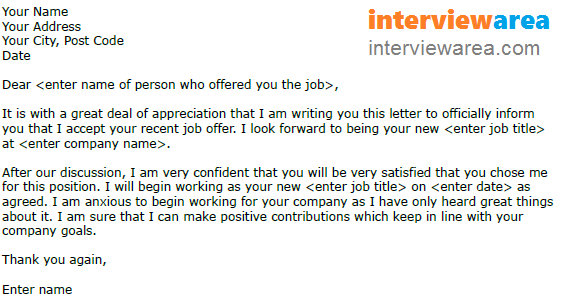 Use this letter example if you are going to accept a job offer from a company. Make sure that you have amended this letter as suitable before sending it to the employers. It is with a great deal of appreciation that I am writing you this letter to officially inform you that I accept your recent job offer. I look forward to being your new at . After our discussion, I am very confident that you will be very satisfied that you chose me for this position. I will begin working as your new on as agreed. I am anxious to begin working for your company as I have only heard great things about it. I am sure that I can make positive contributions which keep in line with your company goals.